Istanbul is one of the most interesting and mesmerising cities in the world. Straddling continents and dating back thousands of years, Istanbul has been at the forefront of world history. Originally known as Byzantium, and then later as Constantinople, the city was finally given the name Istanbul in the early 20th century. Istanbul is a beautiful city located on the banks of the Bosphorus River with one half located in Asia, and the other half in Europe. A city like no other, it offers some of the world’s most unique architecture, culture, art and food, and the atmosphere in Istanbul is an eclectic mix of cultures, religions, backgrounds and languages. Because of its unique geographical location and its fantastic national flag carrier – Turkish Airlines, Istanbul often ends up being a stopover location between flights. Or some tourists, such as myself, try to see most of the country in a two-week itinerary, and find themselves with only 24 hours in Istanbul, or less. 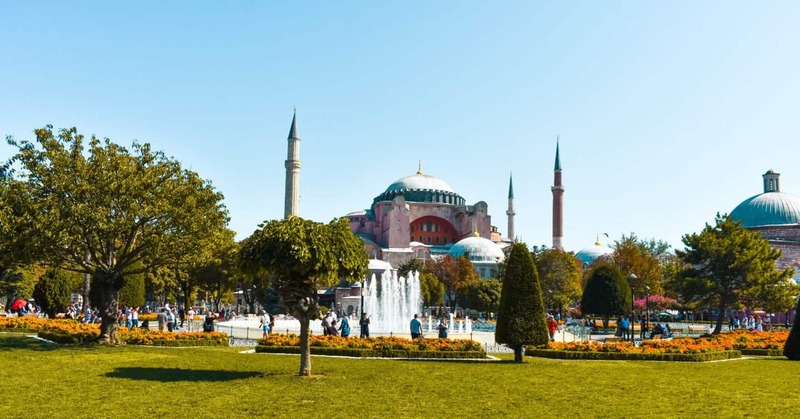 But don’t worry, one day in Istanbul may not be that long, but you can see a surprising amount of popular attractions and tourist sites in Istanbul in that time. 1.2 What time of year is best to visit Istanbul? What time of year is best to visit Istanbul? Istanbul is a unique city with year-round appeal. Summer season (June to September) swells the crowds and the air temperature rises significantly. The very best time to visit Istanbul is the Spring and Autumn months of April, May and October. Even winter is a great time to visit Istanbul, even though it is cold, it can be magically snowy too. Istanbul is absolutely huge. Walking this city in a day wouldn’t be possible, however you can walk between several of the major sites. Public transport is very comprehensive and the tram system is particularly straight forward. However, if you only have one day in Istanbul, then one idea could be to jump on a day tour. With 24 hours or less in Istanbul, it would not be ideal to get lost or disorientated with so many top attractions to see! If you’re fortunate enough to be able to spend one night in Istanbul too, you’ll have thousands of incredible hotels to pick from in this city. There’s really no shortage and so many options to cover every taste and budget. I stayed at the excellent Intercontinental Istanbul located very conveniently next to Taksim Square. It offered the most impressive breakfast and had a lovely pool to enjoy after a long day of sightseeing in the city. You can check rates for this hotel here. If you have one day in Istanbul, there are a few must see attractions that cannot be missed. These include the Hagia Sophia, the Blue Mosque, the Grand Bazaar, Topkapi Sarayi Palace and the Bosphorus River. Fortunately, these are all located in the old part of Istanbul and with a good map, can all be seen on foot. Amongst the top things to do in Istanbul, trying some of the typical Turkish cuisine in some of the best cafes and restaurants in the city is essential and I’ve included a few foodie suggestions below. Unmissable on any trip to Istanbul, this Byzantine structure was once a Greek Orthodox Christian Cathedral, before becoming a Ottoman Imperial Mosque and now finally a museum. At more than 1,400 years old, the Hagia Sophia has to be one of the most impressive museums in the world. Intricately designed and with a mix of religions and cultures having influenced its structural elements, it’s a completely unique place to visit. Located in the historic Sultanahmet area, this spectacular mosque is surrounded by beautiful gardens. A sight to behold, The Blue Mosque is one of the most recognisable structures in Istanbul, with its minarets piercing the skyline from afar. The Mosque isn’t actually blue, but its huge domed ceiling inside is adorned with thousands of beautiful blue ornate tiles. Unlike many mosques, tourists are welcome to come inside and you would be expected to cover up to do so. Just off one of the city’s main streets (Istiklal Caddesi), this Romanesque Tower offers fabulous views across the city. Located in the buzzing Karaköy area, it’s surrounded by great cafes and bars and is a must see during a one day visit to Istanbul. A bridge where time can really stand still and where local fisherman wait for their catch. Connecting both sides of the city over the Bosphorus, a slow walk along the Galata Bridge offers phenomenal views in every direction. If you can afford a time, definitely jump onboard a river cruise which departs from the Eminönü docks, just by the Galata Bridge. The Grand Bazaar is absolutely mammoth, housing more than 4,000 stalls and shops. It is one of the biggest indoor covered markets in the world, so be wary of your route and try not to get too disorientated inside! Thousands of locals and visitors descend on the Grand Bazaar every day, meaning a wonderful opportunity to experience daily life in Istanbul. Whatever you could possibly want, you could probably buy here – just be prepared to haggle your price! Nearby is the Spice Bazaar, another huge market absolutely worth a visit. The city has no shortage of great places to grab a bite to eat and try a Turkish coffeee. One of my favourite cafes I came across during my time in Istanbul was the Latife Cafe near the Galata Tower. This main street stretching from near Taksim Square down to the river at Karaköy is an excellent place to do some shopping in Istanbul. Its international counterparts would be Oxford Street or Fifth Ave, but fortunately, you can find a lot more locally produced products here. I fell in love with the fabrics and interiors shops and couldn’t stop buying the beautifully presented blankets and soaps! This is the heart of Istanbul’s shopping, cafe culture and bar scene, so it’s enviable you’ll end up on this street. It’s also quite steep! Some of the streets in Istanbul are steep! This is probably isn’t essential if you only have one day in Istanbul, but it’s fun to know there are cats everywhere across the city! They’re pretty friendly too, so if you want to make some feline friends, it won’t be hard! Have you been to Istanbul? Did you have longer than a day to explore? I’d love to hear if there are any key places to visit in Istanbul in one day if so! Drop a comment below to tell me! Although I would love to return for longer, I did find I managed to visit a surprising number of the top attractions in Istanbul in one day. I really loved meeting all the friendly cats around the city too! Hopefully this blog post will prove useful if you’re planning your time in Istanbul, whether that’s during a layover or a one day visit within a longer itinerary. If you’re considering a longer trip, you might find my two-week Turkey itinerary here useful, as well as my guides to Bodrum, Pamukkale, Ephesus, sailing the famous Turquoise Coast and Cappadocia here. Disclaimer: This visit to Istanbul, Turkey was entirely paid for by myself and there was no involvement from the tourism board or any hotel. This is an independent guide. Enjoyed my guide on how to spend one day in Istanbul, Turkey? Pin it! I have visited Istanbul a few years ago and I also loved it! I have enjoyed most of the places you are talking about here – The Blue Mosque is the one I was the most impressed with. Looks like you didn’t have the time to explore the Grand Bazaar? P.S. : Love your pictures! Unfortunately no I didn’t! It was actually closed, what a shame!! But I didn’t want to lie about having been or anything! Great tips! I love the history of Istanbul. Istanbul is such a pretty and colorful city. I will love walking through those cobbled stone streets and clicking endless pictures. Great cafes will make the trip more memorable. Hi! I’m super interested in the linen… do you remember what prices were like? Hi Bianca! I bought a bundle of linens (tea towel and large towel sized) decoratively tied with rope and an evil eye, for about £5 🙂 You can haggle on the prices though!